“498 Spurwink Avenue” is located between the CELT-owned Runaway Farm preserve and the Town’s Gull Crest property in Cape Elizabeth, Maine, which both allow public access. Conservation of this 30-acre parcel will allow for critical trail connections between these two properties, expanding opportunities for hiking, snowshoeing, cross country skiing, birding, outdoor photography, and more. If you want to help get the property ready contact stewardship@capelandtrust.org. The varied and inviting landscape near Pollack Creek includes fields, swaths of lush forests, rich wetlands, a lively small pond and high-quality farm soils. 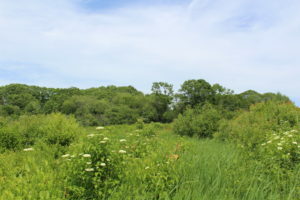 It is also potential habitat for the cottontail rabbit and declining species of birds such as Red-shouldered Hawk, Blue-winged Warbler, Northern Flicker, Blue Heron, Wood Duck, and Bald Eagle. We also envision expanding our popular education and community programs to this property in the future.